In this part, we will consider how to optimize our build for a production environment. We will be looking at how we can reduce the size of our CSS, allow for file caching using hashed file names, and more. 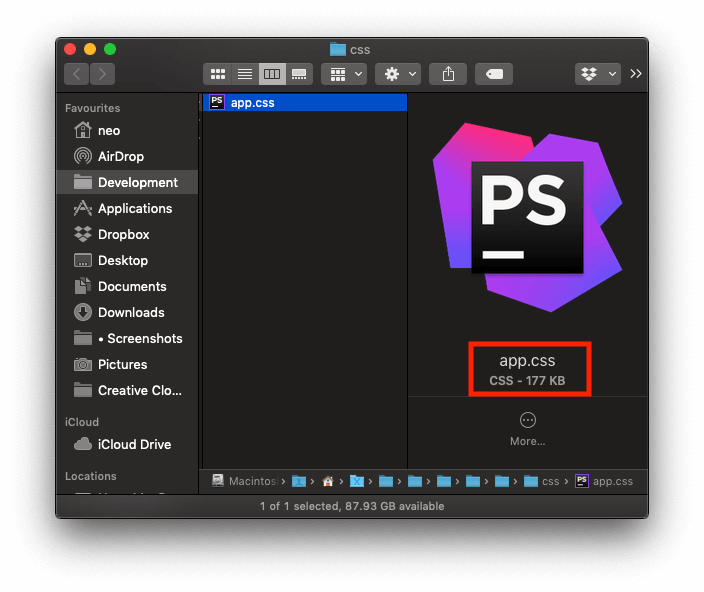 In the previous post we learned how to use webpack to bundle images in our application. We considered how to compress the images and then serve the compressed images. We also considered how to use the url-loader to serve the Base64 representation of the image, when it is less than 8kb. Node.js (>= v6.11.5) and npm installed locally. For this part, we have moved a few file structure changes. There is a skeleton directory you can get from the repo if you would like to follow along. There is also a completed Part-7 folder you can use as reference. The dist/server.js file has been moved to the root directory. This file has no business inside the dist directory. We only want the dist directory to contain files generated by webpack. The dist/index.html file has been moved to src/index.html for the same reason as above. The src directory now organizes the assets into js, images, and scss. The new paths have been updated across all affected files to reflect the new directory structure. OptimizeCssAssetsPlugin only runs when building for production. We renamed the npm build script to dev. purgecss-webpack-plugin - this will remove all the unused CSS selectors from the CSS files. This will make us have smaller CSS files. postcss-loader - loader for webpack to process CSS with PostCSS. precss - lets you use Sass-like markup and staged CSS features in CSS. autoprefixer - PostCSS plugin to parse CSS and add vendor prefixes to CSS rules. html-webpack-plugin - simplifies creation of HTML files to serve your bundles. The first thing we want to do is optimize our CSS. We will do this using the purgecss-webpack-plugin. This plugin will help us remove all unused CSS from our stylesheet. After this, we will minify the CSS files so they have an even smaller size when the build is complete. Now if we build, we will see the entire Bootstrap library has been loaded into the generated file in dist/assets/css/app.css. However, since we will not be using all the available classes Bootstrap has to offer, let’s use the purgecss-webpack-plugin to remove all unused classes from CSS file. As seen above, we first pull in the plugin, then to make sure we only run PurgeCSS when we are in production, we add the plugin inside our if check. You will notice that all the Bootstrap CSS classes, used or unused, will be included in the generated file. You will notice that almost all Bootstrap classes are absent from the class. Remember, the PurgeCSS plugin will scan the HTML file(s) to see which selectors are used and which isn’t. As you can see from both screenshots above, the file size reduced drastically when all the unused CSS selectors are removed. Earlier, we mentioned that the HTML file is no longer in the dist directory. 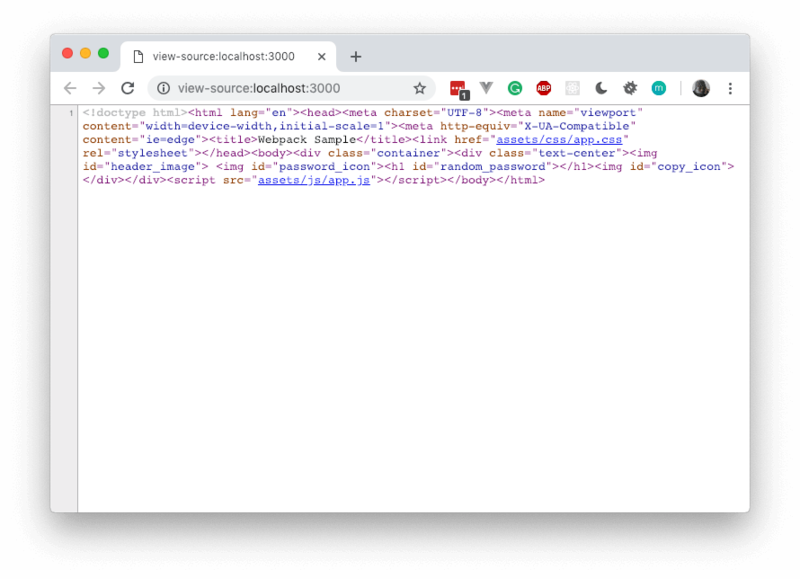 If you check the server.js however, you will notice the server will still try to load the index page from the dist/index.html file. Let’s use webpack to bundle our HTML. In the options, we add the minify option so it minifies the generated HTML when running in production. This will make the HTML file size smaller and thus load a little faster. The command above is a script we added to the package.json's script property. It will build the application and start the server. Now that we have optimized our assets for production, let’s see another thing we can do to make the assets cache ready. Browsers can be instructed by a server to store copies of the assets locally so that when it is requested again it will just load the local version. This is useful because if we do it properly, we will have faster apps that load cached assets instead of making an HTTP request every time for a file that has not changed. 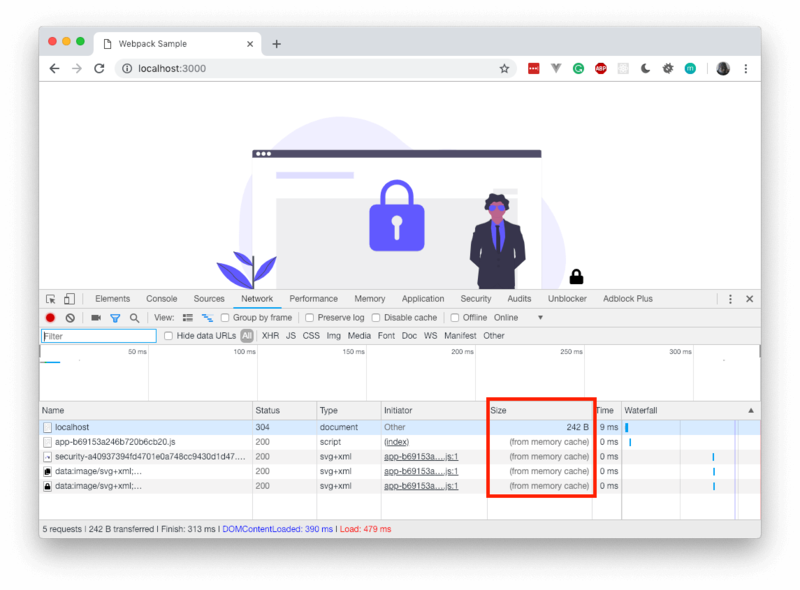 The problem, however, is, if we cache let’s say, index.css, and we make a change to how the file is, the browser has no way of knowing that a change has occurred on the server. This will cause the browser to keep serving the outdated version of the CSS file. With webpack, we can bundle the assets with a hash included in the name of the file. The hash will be generated from an MD5 of the file as is. This means that if the file changes, the hash will also change. This way, when we change some assets, the browser will have to reload the file because it cannot find that file cached locally. Let’s see how this will look. Currently, in the dist directory, our assets are stored with name.ext. Open the webpack config file and replace all occurrences of [name] with [name]-[contenthash]. [name] will be the name of the bundled file and the [contenthash] will be an MD5 generated from the contents of the file. Note: For the url-loader there is an issue that may make [contenthash] fail, so use [name]-[hash] instead. You can read more about caching here. Now when you build, you should notice the hash added to the file names in the dist/assets directory. If you load the first time and reload again, you will notice that the assets will now be loaded from memory. In this part of the series, we learned how we can optimize our assets further and add some caching to the mix using contenthash. In the next part we will look into how we can create our own webpack plugins.